Site design by Stewartry Technology. Thanks for patience, perseverance and adaptability! Site powered by MonkeyWiki, a wiki engine developed by Barnaby Scott. Actually his main occupation is designing and making bespoke furniture, which is constructed as immaculately as his programming code. Take a look at it: Waywood Furniture Creation. Logo design by The BIG Partnership (Fife office, Allan Buchan). Financial assistance for this gratefully received from Forestry Commission Scotland. The photographs come from a number of photographers. For links to their websites, where applicable, see External Links (menu above). Many photographs also taken by Alexander Scott. 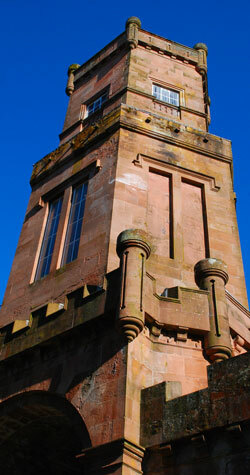 The tower over the archway into Gelston Castle Courtyard was once home to 300 doves.